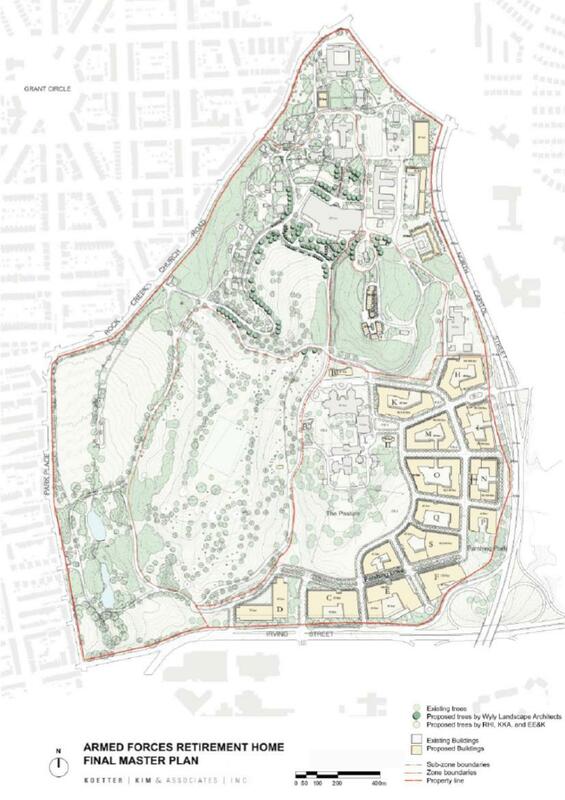 Development of Old Soldiers’ Home’s Zone A Moving Forward | Park View, D.C. Yesterday, both the Washington Post and the Washington City Paper published articles announcing that the Old Soldiers’ Home will begin seeking a private partner capable of developing up to 80 acres of its campus — often referred to as Zone A — as early as next month. The Zone A property is in the southeast corner of the campus bordered by Irving Street and North Capitol Street. The Armed Forces Retirement Home (AFRH) has been planning to develop this portion of their campus for nearly a decade. After the original development plan fell apart, the first attempt to restart the development of the parcel began in 2010, but didn’t get any traction. There was another false start in 2012, followed by news in October 2014 that the development process could begin in early 2015, which seems to be panning out based on yesterday’s articles. The AFRH’s intent to redevelop Zone A should not come as a surprise to many. The Home has long desired to develop Zone A as part of their plan for long-term financial stability. After weathering the recession that originally derailed development at the AFRH, the conditions finally appear to be favorable for them to achieve their goal. This entry was posted on February 4, 2015 at 7:01 am and is filed under Armed Forces Retirement Home, Development. You can subscribe via RSS 2.0 feed to this post's comments. I hope our ANC ensures that all areas of the Old Soldier’s Home benefit – not just the side by Brookland. I’d like to see some development along the Petworth side as well as upgrades to the golf course. Yes, Park View could benefit from having it linked by development to Brookland but it seems the only development being considered is adjacent to Brookland. Also, I hope that upgrades to the golf course and Old Soldier’s Home are being prioritized. This is a terrible shame. Has anyone asked the residents how they feel about giving up almost half of the land? Yes. They didn’t care before when it was a dump and they don’t care now. Im not totally opposed to this but between this and McMillan the traffic on Warder is going to explode. And Warder street was not included in the McMillan traffic impact study. Commuters already use it now to avoid GA and N. Capitol. We need to see the traffic impacts specifically in our neighborhood and plan NOW on how to mitigate them as part of construction. In the plans, I would love to see them redo the stretch of Irving Street between North Cap and Park Place to include a large sidewalk, bike lanes, and fewer lanes for cars to slow down traffic.There is ample space and this would help connect Park View with the new development in the Soldiers Home/Brookland, and eventually McMillan if they can rework the transit system on the other side of the hospital. That area is not pedestrian or bike friendly at all! While they’re at it, I would love to see them replace one of the car lanes into a sidewalk along the soldier’s home all along Park Place, like they have north of Rock Creek Church Road. Yes! This! Any plan put forth should provide a meaningful connection between Park View and Brookland. Especially as it relates to transit between the two. I will go a step further and propose that the city study an at-grade intersection for North Capitol and Irving. Put people first. Make it friendly for pedestrians and bicyclists; slow down traffic; and remove those suburban highway interchanges that are entirely out of place for an urban community. One final step further: once the cloverleaf interchanges are removed, turn the reclaimed land back over to the Home and its chosen developer in order to create a proper urban corner at North Capitol and Irving. Make people feel like they don’t have to get in their car to visit–and just be–in this location, and you will create a successful neighborhood. would be great to see the soldier’s home carriage drives, especially by the pond and around the gold course, be opened on weekends for use for jogging, bicycling, etc.